Compliance By The Book. Closure By The Numbers. We are aggressive in our approach to Medicare Secondary Payer Compliance with a clear focus on solutions rather than services. From Section 111 reporting through MSA and settlement, our numbers speak for themselves. And our clients speak for Tower. Montana State Fund thoroughly enjoys our business relationship with Tower. Not only do they provide a superior level of service and quality work, their customer service is outstanding! They make you feel like family. Tower truly stands out as the premier partner when it comes to anything regarding Medicare Set Asides. Their commitment to providing quality and timely information is the best in the industry. Tower MSA Partners took the complexity and mystery out of the MSA process for CPC Logistics and our TPA. They’ve been instrumental in leading us to properly structure our program for success related to MSAs, both now and in the future. Anne Alabach, CPDM - Workers Compensation Department Manager - CPC Logistics Inc. Thank you Tower MSA Partners for continuing to achieve positive results with Conditional Payment disputes and appeals for my client. As the majority of our claims pool is made up of Medicare Eligible claims, we have a significant amount of Conditional Payment activity and appreciate your quick response and excellent customer service. In addition, we are grateful for the work you did that allowed my client to recover funds that the Department of Treasury had withheld from their business. Your service and results stand out and are the reason we recommend your company. You are the best! I do truly appreciate all that you do for BETA. Tower is doing a great job for us and we truly appreciate you and your team. We value our partnership with Tower and their focus on excellence from start to finish. Whether it is Section 111 reporting or finalizing the last details of an MSA for settlement, we rely on their expertise to ensure we have protected the interests of all parties involved. Claims Department – Tyson Foods, Inc.
Our CEO's strong IT background and a corporate belief that technology must drive execution inspired Tower to develop an extremely sophisticated technology — the Tower MSP Automation Suite — to manage every aspect of our proactive business processes. The suite consolidates our more than 50 years of compliance expertise into the latest, proven technologies. Tower's fully integrated MSP Automation Suite identifies barriers to settlement and prompts resolutions as it tracks each claim from intake to closure and provides end-to-end visibility into the claim's progress. We proactively intervene to address unnecessary medical costs and inappropriate drug usage and obtain the evidence needed for CMS approval before preparing the MSA. We are the only company in our industry with a single point of contact through every step in the process. We remain involved until the closure of your claim and pride ourselves making the process easy for our clients. We are with you every step of the way. Please contact our Intake Team at 888-331-4941 or email: referrals@towermsa.com with questions concerning referrals. A worker diagnosed with PTSD, anxiety and mood disorders received a regimen of psychotropic medications over the years. When the employer started to consider settlement, the initial MSA allocation was $1,687,081 — $30,058.44 for future medicals and $1,657,022 for pharmacy. Tower identified the use of brand name medications, including Wellbutrin, Klonopin, Rozerem, and Neurontin as the key cost driver and recommended working with the claimant attorney and treating physician to switch brands to generics. When the conversion was completed, a physician’s statement was obtained confirming the switch from brand to generic as well as an updated prescription history documenting ongoing generic use. With the physician’s statement properly documented, Tower submitted an MSA with an allocation of $112,572. CMS approved the MSA within eight days, allowing the parties to settle and saving the employer more than $1.5 million in unnecessary pharmacy costs. Tower immediately identified the use of high cost brand name medication in the MSA and helped implement a plan to move the claimant to generics. 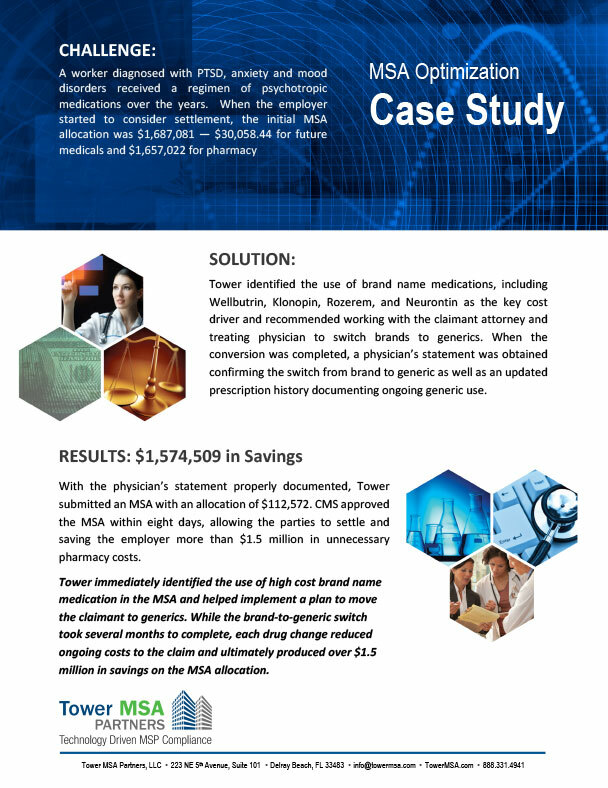 While the brand-to-generic switch took several months to complete, each drug change reduced ongoing costs to the claim and ultimately produced over $1.5 million in savings on the MSA allocation.